British Virgin Islands: The road to recovery for the BVI took another positive turn today when Digicel delivered on its recent commitment to provide vital building materials for the reconstruction phase of post-Hurricane Irma recovery efforts. 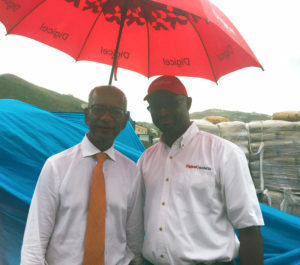 A large donation comprising thousands of bags of cement, several tonnes of steel, sand, gravel and 490 sheets of plywood was handed over to the government of the BVI for distribution to persons in need of help to rebuild or repair their homes. Chairman of Digicel, Denis O’Brien, saw the urgent need for construction materials during his visit to the island last week and immediately offered to help. He acknowledged that rebuilding quickly is vital to the BVI economy as it restores a level of normalcy that facilitates doing business and creating employment opportunities throughout the country. With more construction materials on the way, Digicel’s overall donation is expected to help a signifi-cant number of homeowners and communities build back better.